Science geek Meg is left to look after her little sister for ten days after her free spirited mum leaves suddenly to follow up yet another of her Big Important Causes. But while Meg may understand how the universe was formed, baby Elsa is a complete mystery to her. And Mum's disappearance has come at the worst time. Meg is desperate to win a competition to get the chance to visit NASA headquarters, but to do this she has to beat close rival Ed. Can Meg pull off this double life of caring for Elsa and following her own dreams? She'll need a miracle of cosmic proportions. Just as the forty nine accomplished women have boldly gone, sixteen year old Meg Clark dreams of becoming an astronaut. A quiet achiever, Meg is attempting to revise her lecture for the upcoming competition that will see one student be awarded with an all expenses paid holiday to the NASA Space Center in Houston, an opportunity that Meg's mother couldn't otherwise afford. Until her mother purchases a plane ticket to Myanmar on a whim and leaves Meg and one year old Elsa behind. Alone. Fifteen year old Megara is an aspiring astronaut and in the midst of preparing for her presentation, an opportunity for an all expenses paid vacation to NASA headquarters, when her free spirited mother leaves for Myanmar, a Southeast Asian country where she will aid underprivileged communities. Her mother also leaves behind Elsa, an infant who cannot comprehend where her mother is and expects her elderly father to shoulder the burden of two children. Rather than place Elsa in the dangerous environment of her grandfathers home, Meg decides to become Elsa's primary caregiver while balancing school and preparation for her presentation. Meg's mother was infuriating and left me feeling irate. Free spirited is for those without obligations, her mother has two young children and an elderly father who excuses his daughter's behaviour. Although her grandfather is reluctantly accommodating, his home resembles an unhygienic menagerie and refuses to inconvenience himself for his young granddaughters. Her grandfather is lovely, but why would any responsible adult allow a fifteen year old girl to accept responsibility for an infant sibling. Being a preoccupied adolescent consumed by science, Meg and step sister Elsa are relatively strangers, sharing the same irresponsible mother and little else of significance. Through circumstances, the two sisters begin to care for one another. It was wonderful to see Meg being supported by new and unlikely friends in her mentoring program, especially sarcastic and resolute Annie who is a student with Autism. A friendly rivalry and gentle friendship were the foundation of an enchanting romance. 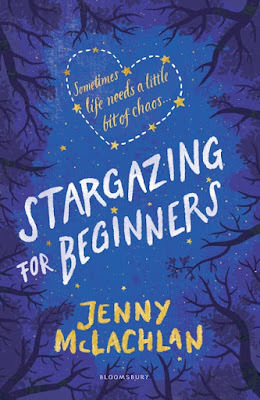 Although it was lovely and incredibly entertaining, the adult characters within Stargazing For Beginners were irresponsible. From their mother and grandfather, to the caregiver at Elsa's daycare center who suspected their mother may have been absent. How did the school facility not realise the change in her behaviour? The responsible and astute student now unpolished and exasperated has gone unnoticed. 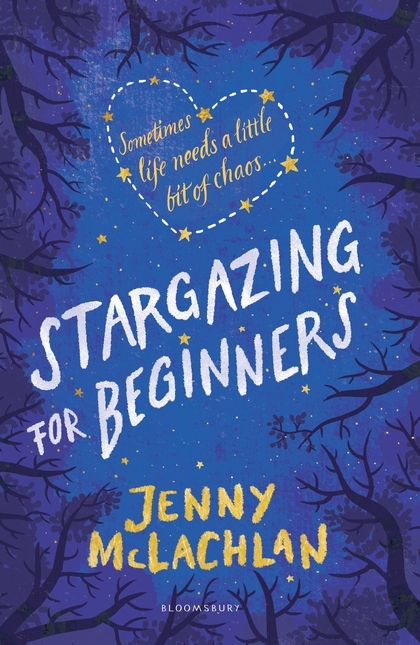 Jenny McLachlan is a magnificent author, a wonderful storyteller and an absolute delight. Amusing, entertaining and incredibly charismatic. Love the eye roll! I think I might find it a little hard to get over the mother/grandfather leaving a one year old in a teenager’s care. If she was 18+ and he was sickly, fair enough for the old bloke to let her take charge, other than that, no! That aside it sounds like a sweet and fun story. Discounting the lack of responsible adults, the rest of the story was super lovely Sarah. New to your blog, so hello! Yeah, I understand how frustrating it must feel to read a character like the mom in this one. I didn't personally read the book or anything, but that type of characterization troubles me. But, unfortunately, there are people like that out there and their kids need to know they're not alone. I am glad the book was sweet to read, despite the adults failing at life. Hey Dina and lovely to meet you! It troubles me too. There seems to be a trend in young adult of missing adult supervision and parental guidance. I would have liked to have seen a more positive and supportive home environment for Meg and Elsa but Meg was such a wonderful character. I have seen this book around a little but it never captured my interest! I personally hate when the adults are super irresponsible in a book because it infuriates me so much (however at the same time, it can be realistic) so I'm just going to skip this one! Thanks for the fantastic review as per usual Kelly! It can sadly. For various reasons, parents might not be able to care for their children but in this instance it was due to her mother being irresponsible and only thinking of her own needs unfortunately. It's a wonderful read about sisterly love and finding your own place in the world. The romance was lovely too. The mother literally left and called from the plane. I wanted the grandfather to stand up and care for the girls but he wasn't really willing to arrange his life and it seems as though it was an inconvenience for him. He made dinner for them each night but apart from that,t hey were really on their own. I dislike such technical unbelievable plot points in a book. Why would the school not notice that? I recently read a book where the hero has a stone that protects him and he gives it to every stranger he comes across (read demons) to examine. Finally it works against his favour. The villain does not return the stone. Such things make it a weak plot indeed. That sounds like an... Interesting storyline. I find it difficult to suspend disbelief with books at times but apart from the irresponsible adults, it was such a wonderful storyline and girls being so heavily into science is a reason to celebrate alone. Unfortunately, there are irresponsible people like that in the real world, and I just want to shake them. Meg sounds like a good YA character though. She was wonderful Christy. She cared for Elsa and it was so lovely seeing their relationship bloom. I really don't get the vast amount of irresponsible adults in YA fiction. I know there's some ridiculous people in the world who do leave their children alone, but come on; it's so overdone. The cover is absolutely stunning isn't it! There seems to be so many doesn't there apart from #LoveOzYA titles. I find that Aussie authors tend to almost always have very family orientated characters and parents that will involve themselves in their children's lives. I really enjoyed this one despite the irresponsible adults. She's so lovely and although she's had to take on so much responsibility, she manages wonderfully well. I felt such a connection to her characters and her determination was brilliant. Ah, the usual disappearing parent who is irresponsible. Sounds pretty typical, but I like the sound of Meg and Elsa's sisterly bond and the way they got closer to one another. Lovely review Kelly! Thanks Jeann. It was a lovely read despite the irresponsible adults. I loved how Meg cared for Elsa and they had virtually begun as strangers. Elsa was adorable. Ugh, irresponsible adults are just the worst. I love Jenny's books, but I don't think I can get over adults that can't adult. I don't care how free spirited you are, when you have dependents that rely on you, you don't just up and leave them. Grrr. I'm irritated already and I haven't even picked up the book yet! I'm a massive fan of hers too Joy, she creates the most brilliant term characters that are so,so wonderful. Meg is no exception. I felt the same. She literally didn't tell her children or father and called from the plane. The frightening aspect is that many teens can experience the same abandonment and forced to mature far quicker than they should. I am really excited for this one! I am a huge space and science geek, so I guess that's the reason? XD I am also really excited for the sisterly bond! Can't wait for this book :) Great review Kelly! You'll adore this one Prabhleen. Also, I just reviewed The Secret Science of Magic who's main character is into mathematics and is absolutely brilliant. That's also out now so check them both out! The title is so cute! And I'm glad to see overall you enjoyed it! But I can totally imagine the super frustration you would feel with such irresponsible adults! Thanks sweetheart. The adults were so incredibly irresponsible but luckily the storyline was so wonderfully written and lovely. I just couldn't get over how completely narcissistic and irresponsible her mother was. Free spirited people don't leave behind two children and expect their elderly parent to are for them. But I loved the girls, their relationship and her friendship circle. It was so lovely. I'm thrilled you enjoyed this one too Casey.